Weight: .2 oz. (5.6 g.) / .4 oz. (11.32 g.) in 1 pc. Calories: 30 calories (estimate) for 1/2 pc. 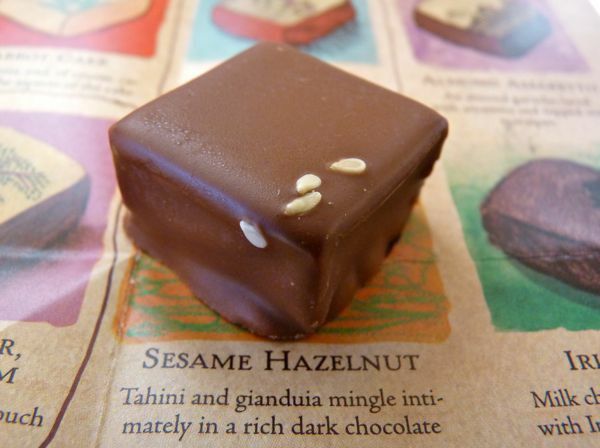 Today was Day #5 of Chocolate and Sesame Theme Week. The sesame tahini and gianduja (hazelnut paste) mixed into a dark ganache made this dark chocolate from fleurir (Wash., D.C.) taste as creamy as a milk chocolate.